FINRA also identifies other characteristics typical of the one-third of households with a taxable account. Those with incomes over $50,000 were much more likely to have them – by 22 percentage points – than households with lower incomes. Other contributors include a college degree, greater financial literacy, and a higher tolerance for risk. 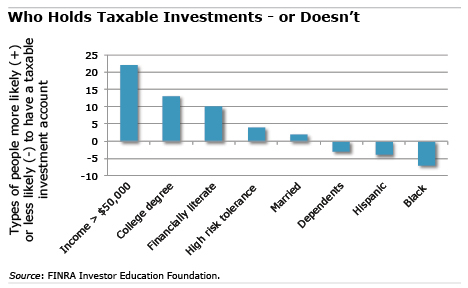 Couples were also more likely to have a taxable investment account but households with dependents less so. Note: 33 percent of U.S. households have taxable investment accounts; 29 percent have only tax-favored retirement accounts; and 38 percent have neither. This may be demonstrable, but it still grates at me, seeming to suggest that my inability to set aside more than $20k annually is an indicator of financial illiteracy. [Racism] keeps blacks out of good quality jobs, so where would the income come from to invest?